Every city has it’s own flavor!! And every city has a time when the flavor is at it’s best! 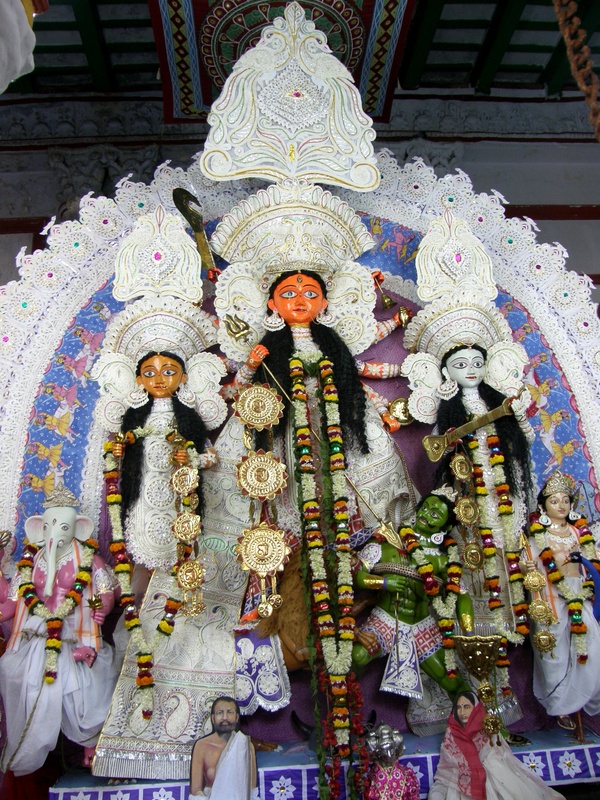 Kolkata is no exception and it’s at it’s best during the five days of Durga Puja. The city takes the looks of a fairyland by night with artistically arranged strings of fairy lights not only draping the trees and poles but to tell stories. 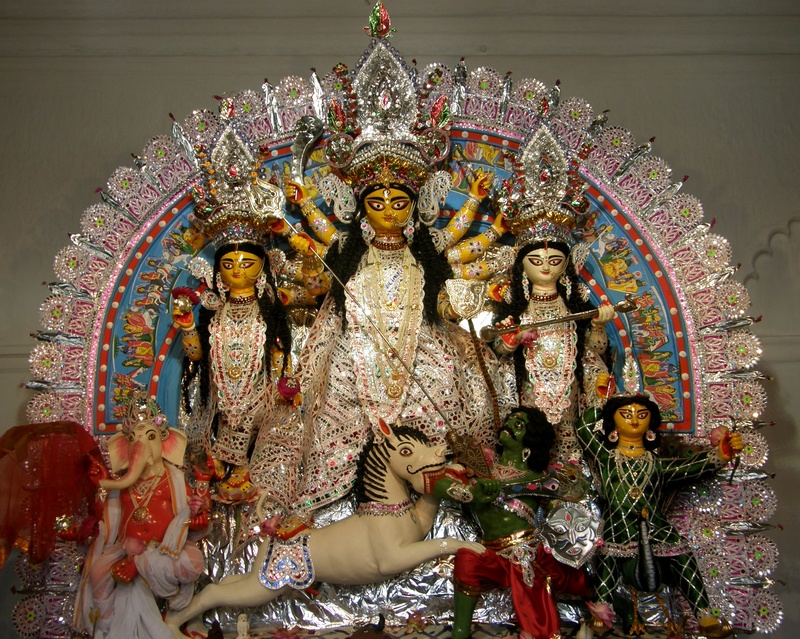 The tradition of Durga Puja is old and there are houses (though at present most of the Pujas are a community affair, in the nineteenth century most of the Pujas were hosted by rich zaminders/landowners and kings of the princely states.) 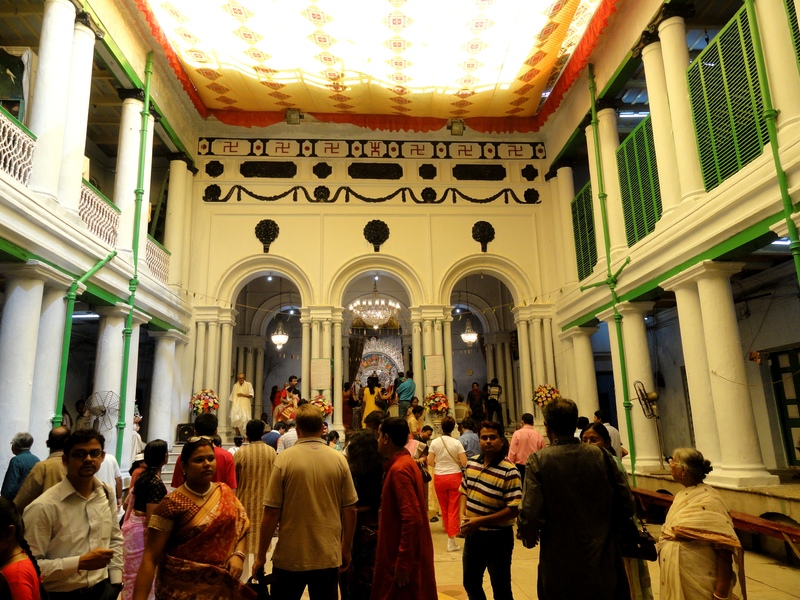 where Durga Puja is being held for more 250 years without a break. 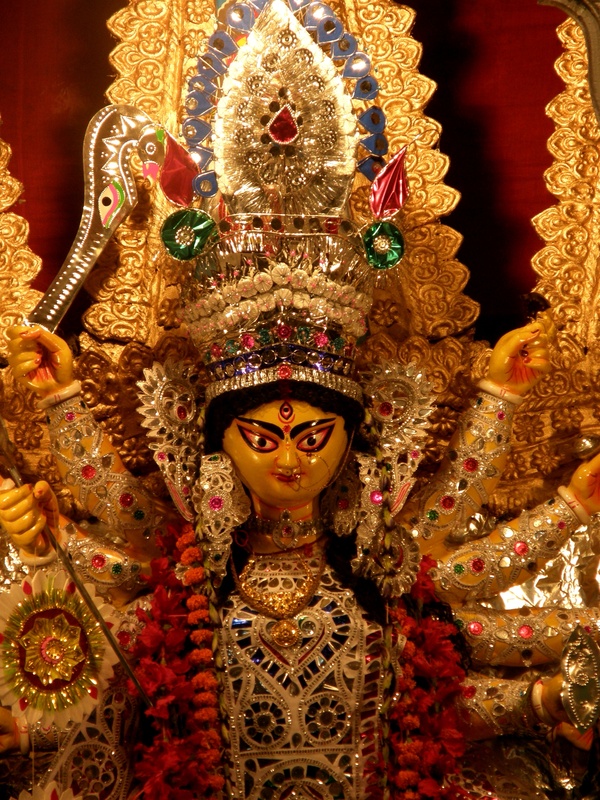 In Bengal, Devi Durga primarily is the daughter who comes home, once every year for these five days, with her children all the way from Himalayas. So the feelings that run is more of affection and love rather than awe. Months of preparation in constructing the idols and various other rituals which start almost a month ahead finally culminates in the special function of these five days. Here are some glimpses of a few such old traditional Durga Pujas held in such old families in their family-homes. Some are being funded out of family trusts and some perhaps by the members of the family. The very fact that such a tradition is being continued over centuries impresses one. A speciality of the idols of the traditional pujas is that all the idols are put against one common frame and not put separately and independently, which is a setting very commonly seen in other idols. 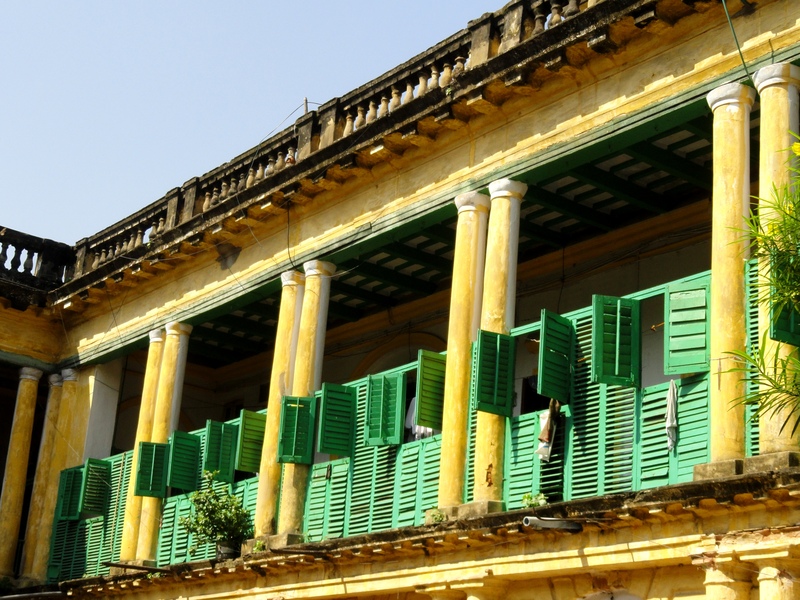 Old Kolkata and it’s traditions always held a special place in my heart. Reading the stories since childhood based on Kolkata made me familiar with the names of the roads and landmarks and gave me a sense of déjà vu ever since I came to Kolkata. Seeing some of traditional Pujas in some of the well known houses of the yore just strengthened that. 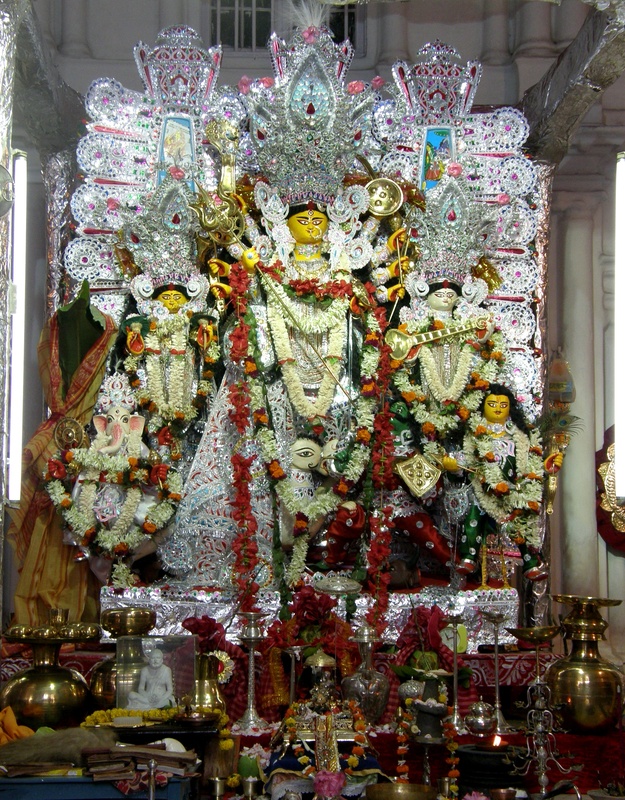 This is the idol in the family home of Rani Rashmoni in Janbazar. The puja here is continuing since 18th century. Rani Rashmoni , widow of a rich businessman and landowner, handled the property affairs very effectively, till her minor children grew up. It must have been a difficult feat to achieve more than 250 years back. 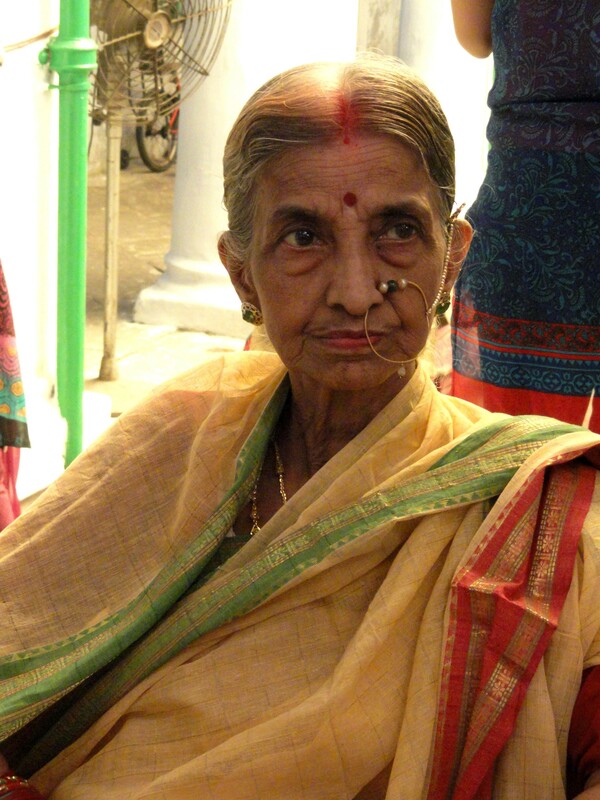 She is better known as the person in whose temple Shri Ramakrishna Paramhansa joined as a priest. Though the family house seems to have seen better days the tradition continues even now. This is the image from the Chunder family Puja. This too has been continuing since 1877, without any break. The Chunder family was well known for their social and political service as well their contribution to the freedom movement of India. Even now some of the members of the family are well known in social/political/educational circles. 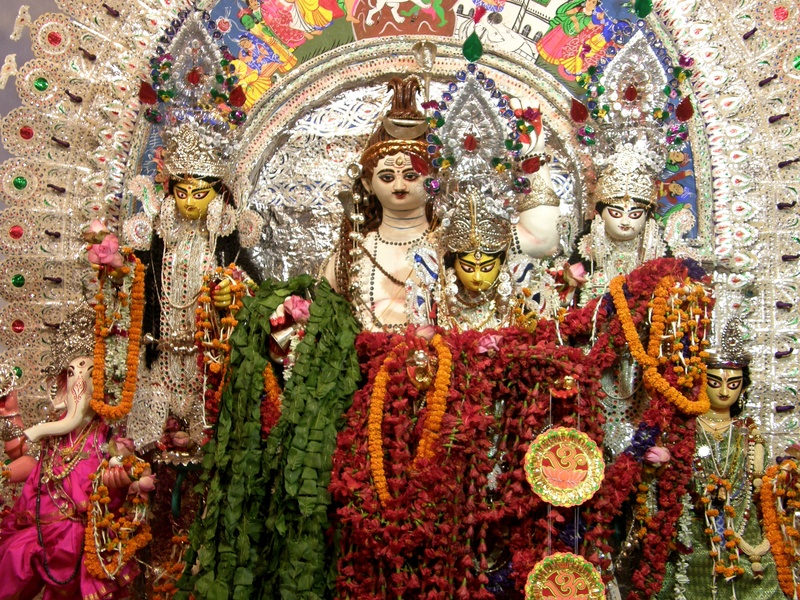 Thanthania Dutta family puja is another one which is continuing over centuries. The ladies of the family wear a special nosering during the festival. The idol here is truly the daughter of the family as here her father brings her in along with her family and she is depicted as the daughter and not as the demon-killer. 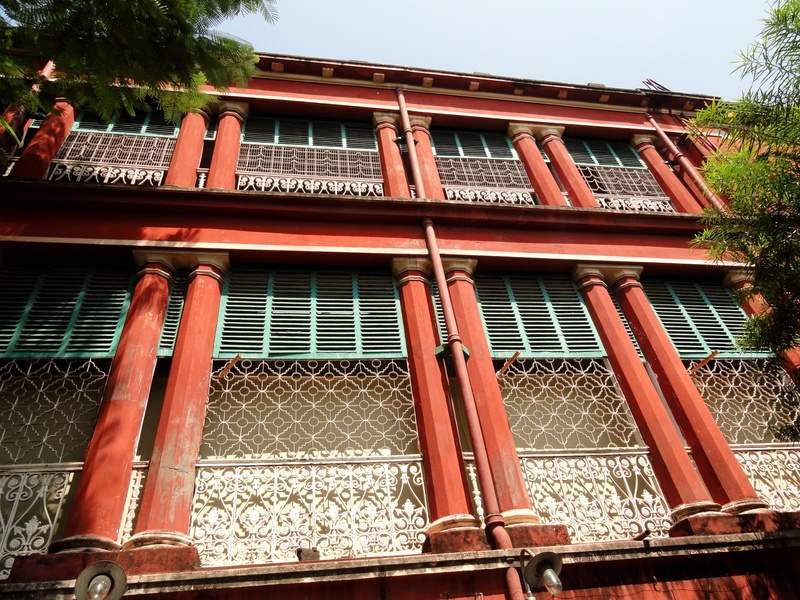 The lovely red house and quite a few similar looking adjacent houses belong to the descendents of Ramdulal Dey but better known by the names of his sons Latu Babu and Satu Babu (they seem to have been more popularly known by their pet names!) The family seem to have become rich through business of various commodities but primarily of salt and owned large number of properties in Kolkata. The puja is more than 200 years old. Khelat Ghosh was one of the richest businessman of his times and was quite popular with the East India Company and the Britishers in general. He owned a huge number of properties in Kolkata including the land on which Victoria Memorial was built, which is presently one of the most prominent landmarks of Kolkata. His palatial house has been declared a heritage house. 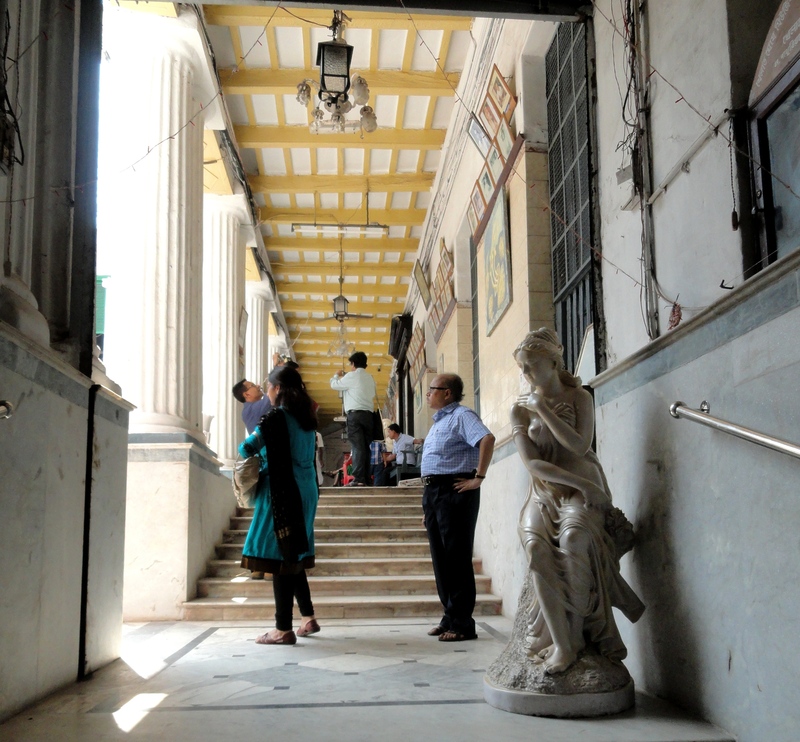 The well maintained house has beautiful marble statues everywhere in the passages and in the centre courtyard. 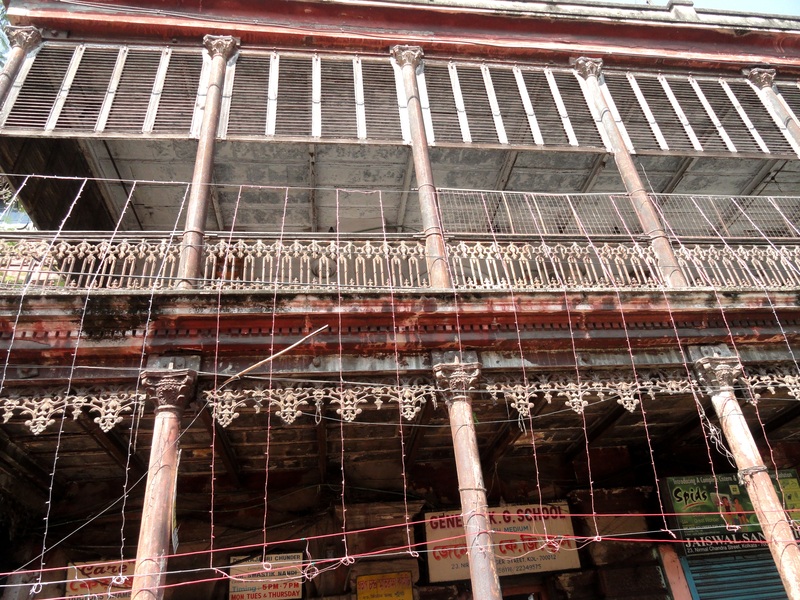 Raja Naba Krishna Deb of Shobhabajar was not only a wealthy landowner but also owner of Sutanuti one of the three villages from which the present day Kolkata grew. 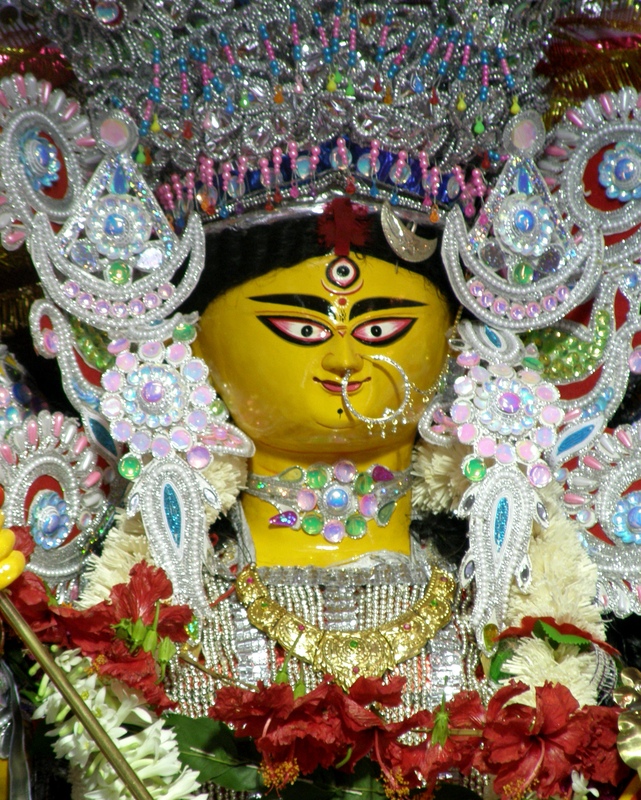 The Durga puja in his house was started in 1757. On one hand people like Robert Clive (he wasDewan/Chief Minister of Lord Clive)and Warren Hastings visited this Puja while on the other Ramakrishna Paramhansa and SwamiVivekananda came here too. All social and political leaders of the past visited the Puja. The first civic reception of SwamiVivekananda after his famous visit to Chicago was also held in these premises.